Machine learning is a set of methods used to create computer programs that can learn from observations and make predictions. Machine learning uses algorithms, regressions, and related sciences to understand data. These algorithms can generally be thought of as statistical models and networks. Deep learning is a subset of machine learning methods. Data is parsed through multiple layers of a deep learning network so that the network can draw conclusions and make decisions about the data. Deep learning methods allow for great accuracy on big datasets, but these features make deep learning much more resource-intensive than classical machine learning. For several decades, machine learning has been used as a method of achieving artificial intelligence in machines. At its core, the field of machine learning is focused on creating computers that can learn and make decisions, which makes machine learning well-suited to artificial intelligence research. However, not all machine learning models are meant to develop “true” artificial intelligence that perfectly matches or exceeds human intelligence. Instead, models are often designed to research specific, limited problems. Deep learning was proposed in the early stages of machine learning discussions, but few researchers pursued deep learning methods because the computational requirements of deep learning are much greater than in classical machine learning. However, the computational power of computers has increased exponentially since 2000, allowing researchers to make huge improvements in machine learning and artificial intelligence construction. Because deep learning models scale well with increased data, deep learning has the potential to overcome significant obstacles in creating true artificial intelligence. 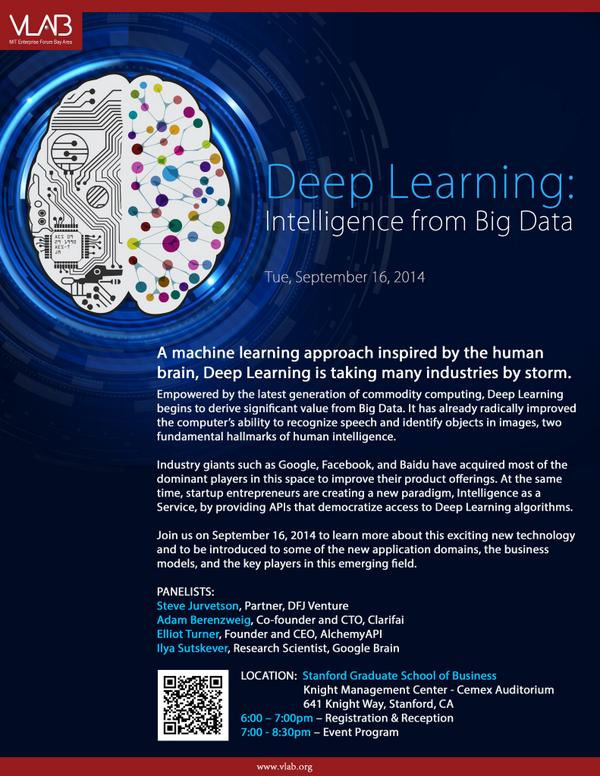 Machine learning and deep learning are both algorithmic. In classical machine learning, researchers use a relatively small amount of data and decide what the most important features are within the data that the algorithm needs in order to make predictions. This method is called feature engineering. For example, if a machine learning program was being taught to recognize the image of an airplane, its programmers would make algorithms that allow the program to recognize the typical shapes, colors, and sizes of commercial airplanes. With this information, the machine learning program would make predictions on whether images it is presented with included airplanes. Deep learning is generally differentiated from classical machine learning by its many layers of decision-making. Deep learning networks are often considered to be “black boxes” because data is parsed through multiple network layers that each make observations. This can make the results more difficult to understand than results in classical machine learning. The exact number of layers or steps in decision-making depends on the type and complexity of the chosen model. Machine learning traditionally uses small datasets from which to learn and make predictions. With small amounts of data, researchers can determine precise features that will help the machine learning program understand and learn from the data. However, if the program runs into information that it can’t classify based on its pre-existing algorithms, the researchers will typically need to manually analyze the problematic data and create a new feature. Because of this, classical machine learning does not usually scale well with massive amounts of data, but it can minimize errors on smaller datasets. Deep learning is especially suited to large datasets, and models often require large datasets to be useful. Because of the complexity of a deep learning network, the network needs a substantial amount of training data and extra data to test the network after training. Currently researchers are refining deep learning networks that can be more efficient and use smaller datasets. Machine learning has variable computer performance requirements. There are plenty of models that can be run on the average personal computer. The more advanced the statistical and mathematical methods get, the harder it is for the computer to quickly process data. Deep learning tends to be very resource-intensive. Parsing large amounts of information through multiple layers of decision-making requires a lot of computational power. As computers get faster, deep learning is increasingly accessible. Traditionally machine learning has a few common and significant limitations. Overfitting is a statistical problem that can affect a machine learning algorithm. A machine learning algorithm contains a certain amount of “error” when analyzing and predicting with data. The algorithm is supposed to show a relationship between the relevant variables, but in overfitting, it begins capturing the error as well, which leads to a “noisier” or inaccurate model. Machine learning models can also become biased toward the idiosyncrasies of data they were trained with, a problem which is especially apparent when researchers train algorithms on the entire available dataset instead of saving a portion of the data to test the algorithm against. Deep learning has the same statistical pitfalls as classical machine learning, as well as a few unique issues. For many problems, there isn’t enough available data to train a reasonably accurate deep learning network. It’s often cost-prohibitive or impossible to gather more data on or simulate a real-world problem, which limits the current range of topics that deep learning can be used for. Machine learning and deep learning both describe methods of teaching computers to learn and make decisions. Deep learning is a subset of classical machine learning, and some important divergences make deep learning and machine learning each suited for different applications. Classical machine learning often includes feature engineering by programmers that helps the algorithm make accurate predictions on a small set of data. Deep learning algorithms are usually designed with multiple layers of decision-making to require less specific feature engineering. Deep learning is traditionally used for very large datasets so that the networks or algorithms can be trained to make many layered decisions. Classical machine learning uses smaller datasets and is not as scalable as deep learning. Although deep learning can learn well on lots of data, there are many problems where there is not enough available data for deep learning to be useful. Both deep learning and machine learning share standard statistical limitations and can be biased if the training dataset is very idiosyncratic or if it was collected with improper statistical techniques. Kelsey Robarts. "Differences Between Machine Learning and Deep Learning." DifferenceBetween.net. 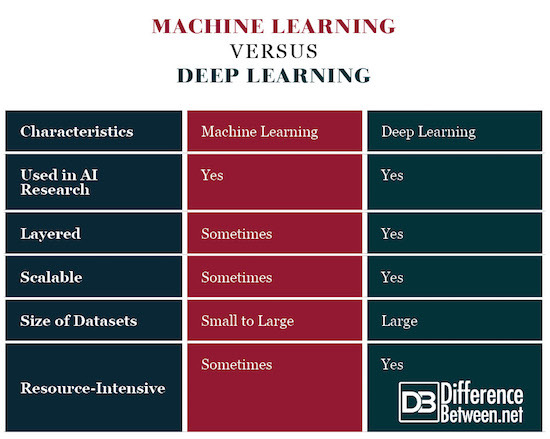 July 23, 2018 < http://www.differencebetween.net/technology/differences-between-machine-learning-and-deep-learning/ >.